This page is about the latest A13 version of the Ampe A76 tablet. Note that Ampe released different hardware under the name A76. 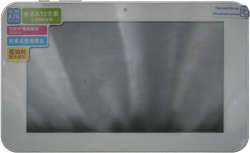 Ampe manufactured different tablets under the name A76. Older versions use the A13 SoC and more recent versions ship with an A20 or A23 SoC instead of the A13. This version of the tablet ships with a Windows Phone-ish interface for Android (tiles on the homescreen). The device is supported and maintained in mainline U-Boot. There is no mainstream kernel support at this point. Linux (sunxi-3.4 branch) properly supports the device. For building u-boot, use the Ampe_A76 target. For building mainline U-Boot, use the Ampe_A76 target. The device does not ship with root access enabled: ADB shell runs as unprivileged user. However, the /data/local/tmp trick to gain root access works. Any button (VOL-, VOL+) triggers FEL mode at boot. The devices uses UART1 for U-Boot and Linux messages: make sure to properly set console=ttyS1 and spawn getty on ttyS1. The back case is rather hard to separate from the front: using a plastic tool is highly recommended! There are up to 14 clips to pop open. The clips are far inside the inner part of the case, so don't hesitate going deep with a plastic tool. It's easier to start on the side with the connectors. Locate the UART on the back of the PCB according to the pinout and just solder on some wires according to our UART howto. This page was last modified on 26 May 2016, at 08:20.